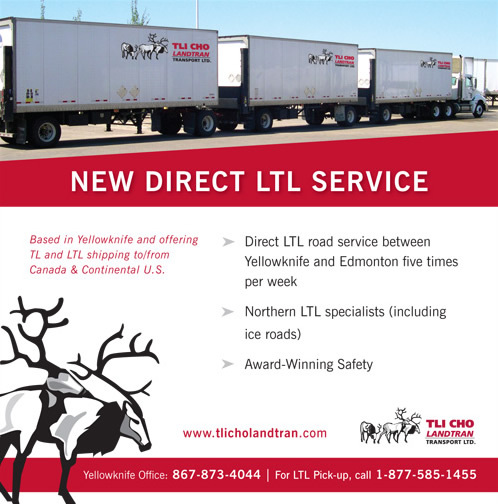 Trucking Across North America - Landtran Systems Inc.
We would like to announce that Landtran TL has decided to further its consolidation into one cohesive unit providing a broad suite of transportation services, Landtran Truckload Group. December 10, 2018 - Pacific Coast Express Ltd.
October 9, 2018 - Landtran Systems Inc.
April 1, 2018 - Landtran Systems Inc.
July 17, 2017 - Landtran Logistics Inc.
Shane Reynolds, ops manager of Landtran Logistics' Prince George facility, is becoming an old hand at helping people in distress. February 23, 2017 - Landtran Logistics Inc.
February 16, 2017 - Landtran Logistics Inc.
Landtran Logistics Inc. has taken the first step into the future with the implementation and training on PeopleNet Fleet Manager. July 07, 2016 - Landtran Express Inc.
Landtran Express is proud to have supported the 8th Annual Suit Yourself Afternoon Tea fundraising event. The devastating fire in Fort McMurray not only caused tremendous destruction, but it impacted people of the city deeply. The personnel at Landtran Express were no exception, as they all had to leave their homes and were unable to work for the entire month of May. June 24, 2016 - Landtran Logistics Inc.
Landtran Logistics reports today with mixed emotions that Mike Choloniwsky is retiring today after over 25 years of service. June 08, 2016 - Landtran Logistics Inc.
After 3 years running the USA lower 48 with his wife Roxanne as a Hwy Driver for H&R Transport Dennis Joined us in June 8 2001 originally as a driver running in our USA fleet. June 06, 2016 - Landtran Logistics Inc.
May 13, 2016 - Landtran Logistics Inc. Trucking Safety Council of BC (TSCBC) honoured Landtran Logistics Inc. today with the Certificate of Recognition (COR) Award of Excellence for achieving the highest standards of safety system excellence. September 21, 2015 - Landtran Express Inc. The time has come! The signs are up and we have officially moved into our new office in Grande Prairie, Alberta.